Average US sale price is $24,995 complete for the same options as the full system supplied by competition except our systems price includes exclusive signature-based process control. No competitor offers true signature analysis nor process control capabilities found in the SAMview software. This price includes our most common set of options and allows for complete upgrade to any product we offer without additional hardware! No downtime for upgrading your system! Upgrade options include control based on extracted signature features, in-die dimensional measurement, and advanced real-time in process calculations. Most other presses - 2 Sensors each connection, 4 total, $700 adder. Double Action Presses - Require A08 card instead of A6D card, 8 sensors, $1500 adder. Special custom sensors may be required for some double action presses. Prices start at $6K for die protection systems and go as high as $35K with multiple processors and full suite of software featuring process control functions in signature analysis, process feature extraction, and advanced real-time process control calculations (thickness, hardness, n-factor, etc.). What Unique Benefits Does this Package Offer? You can run other PC based programs on the same system or access data such as die drawings, email, printing, archives, etc. since the SAMview product is running on Windows 2000 Professional and can live with other products...in fact it can integrate with other software using OPC. Access the information you need to solve problems without leaving the press area! 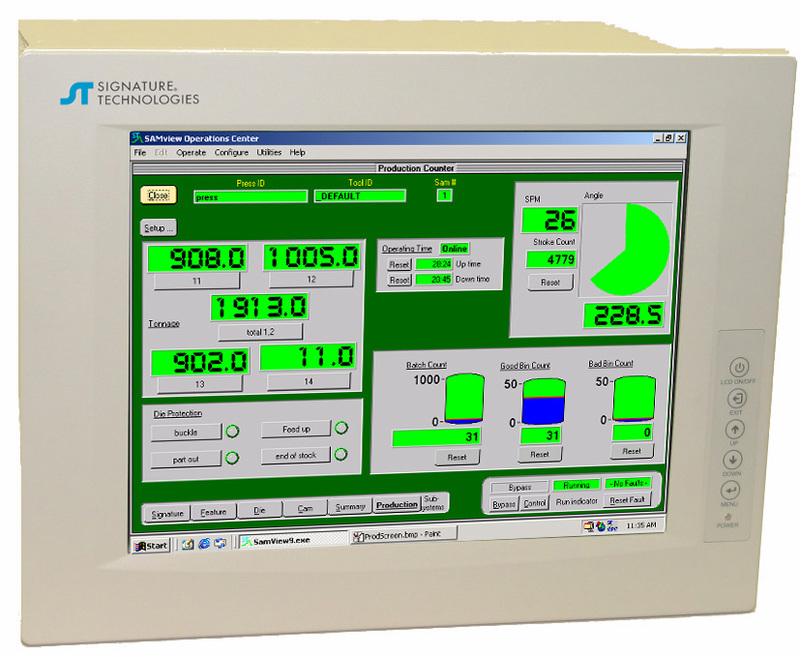 It has optional process control functions for in-die measurement and process signature capabilities that go far beyond the functionality of the competitive products. It is a modular product requiring only software for expansion to both current and future extended products. New versions of the product or additional functionality can be added using CD or internet download upgrades. This package provides a no cost exchange, at time of purchase/startup, for switching between different types of sensor configurations, resolver interfaces, or packaging. No product has the flexibility that the signatureACE® PIP offers because of it's PC architecture and unique product design. 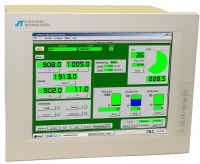 Advanced users can modify the displays which have been created using National Instruments LabWindows© (National Instruments). The PC architecture enables the removal of barriers between the IT department and the plant floor for data retrieval, setup integration, batch control/monitoring, part quality recording, production status information, or any other data integral and available at the PIP. Reliability of the signatureACE® product is exceptional and best validated by customer referral. What Features Does this Package Offer? PIP Industrial PC with Windows 2000 Professional, 1.2GHz, 512M RAM, 40G or better HD, CD, 3.5" Floppy, Dual Ethernet LANs, Internal Real-time SAM network, 12" touch-screen. Unit supports multiple USB, serial, and parallel ports. HD can be replaced with compact flash drive at extra cost. Through the stroke (CCM) press protection monitor that assures the press does not operate outside it's designed load curve ... and, you use a word processor to set it up, no outside service charges. Die-setup tool database with signature verification and notepad. Signature Analysis using patented two-dimensional limit setting and position-based acquisition ...the only system using this technology that works on the plant floor and has the sensitivity without nuisance faults to detect slugs the size of sugar grains in a press running 600 strokes a minute at 60 tons! Complete Press/JOB/Tool historical database with recording of every event, alarm, and user actions. More SA2000 cards which double the capabilities of one card each time you add one. Processors are synchronized to insure that all date is referenced to the same position base. Modify card formats for changes in types of points and quantities. Add Feature Extraction capability that allows you to extract specific features of the process and monitor them such as bend angles, hole diameters, punch condition, material thickness, material hardness, surface properties, etc. Add Advanced Math functions that solve real time equations such as real thickness and hardness when both variables are changing at the same time, work hardening coefficient N, stretch draw properties.